This one has been percolating for many years now. Like many, I first heard the charms of Real Life when their excellent single “Send Me An Angel” managed to get a leg up on the US charts; then besotted with both synthesizers and all things Australian. The atmospheric video didn’t hurt the MTV play, either. 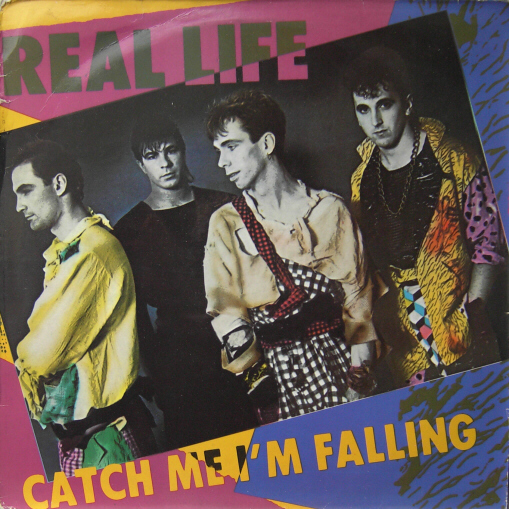 I remember going to Crunchy Armadillo Records and buying the LP as well as the 12″ single of “Send Me An Angel.” A little while later, I ran across the remixed US 7″ single of “Catch Me I’m Falling” and that was it for a long time regarding Real Life. Not before I actually saw the band live on their US tour for this album, though! It was the third rock concert I ever attended and I was very happy to see them open up for Berlin on their “Love Life” tour. Truth be told, I thought that they were a more interesting band all around! I remember thinking to myself that “I may never see Ultravox [so true] but at least I was seeing another synth-rock back with a violin player!” That had to count for something. The band were excellent live and it was exciting to see an synth-rock band that was doing some good work and getting some reward for their efforts. Surprisingly, this Summer, history repeats itself; at least in Australia. The follow up to “Heartland” was the “I-swear-I-never-saw-it” album “Flame.” What’s interesting about both of their first two albums was that they only made the CD format at the time of release in Germany in pressings that I have never seen in 33 years of scouring bins of import CDs. 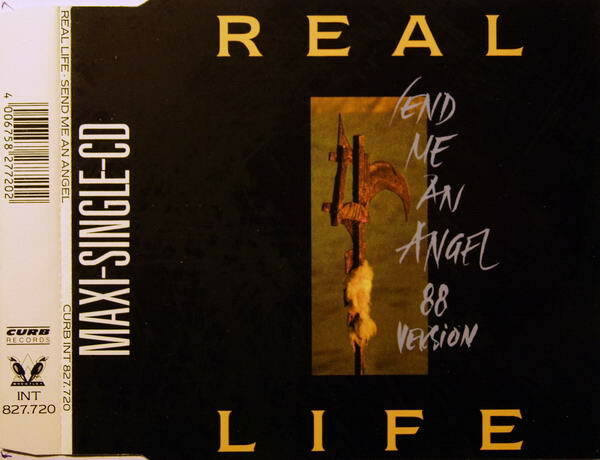 Probably the initial spark of remastering my version of this CD occurred when I got the 1989 Curb US comp “Send Me An Angel” in 2010, which thankfully had remixes that I didn’t previously have, and that got the Monastic wheels turning on the notion of a REVO CD. It’s now ready to face the world. After all, the 1983 German CD routinely sells for three serious figures and I was not going there. Then there was also the notion that a CD mastered from vinyl in 2016 on my equipment could really sound better than a dawn-of-time remaster from 1983. Sure, sure. There was one other pressing: the band’s own CD issued in 2009, but now even that’s selling for stupid money, and I suspect that the band just replicated the 1983 German CD, if anything. The real tipping point that pushed me into action was finding a mint, sealed copy of the “Heartland” album for $2 in the cheapie bin at Harvest Records late last year. 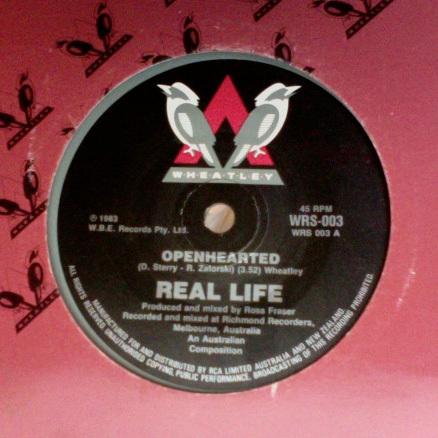 I then did some research and discovered that I had all of the bonus tracks that ideally should be on such a title… with the exception of an Oz-only non-LP B-side on the Oz single for “Openhearted” which, $7 and postage from Australia later, came home to roost in my Record Cell in February. So, armed with all of the bonus tracks that the never-before extant DLX RM of “Heartland” should indeed have, and also the still wondrous ClickRepair software, I set about to make the CD I am now blogging about. I should mention that it sounds amazing for vinyl rips, but then again, it was a mint copy at my disposal! I began the process in February and with May knocking on the door, I am finally getting around to assembling my copy. The actual remastering went quickly. The vinyl was super clean and the scant noise floor that any vinyl has was no match for ClickRepair. As usual, it was the details of mere replication that stymied me and my limited free time. Where’s that PA when you need them? 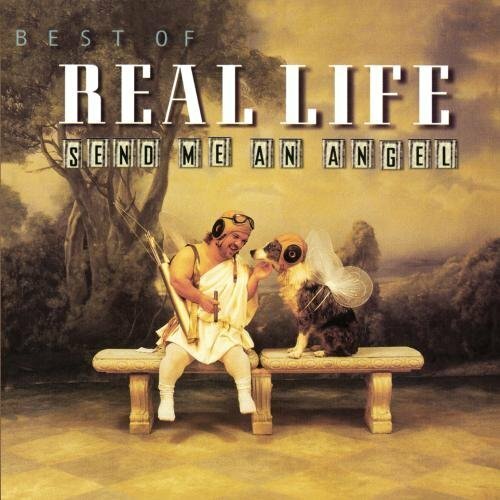 We all know “Send Me An Angel” and it’s one of those perennial songs for me. I didn’t get sick of it 33 years ago and I don’t think it’ll ever happen. The band had their breakthrough single produced by Ross Cockle, and he did a great job of helping the band craft an atmospheric and stirring synth ballad that had legs to last and then some. The album, was for the most part produced by Steve Hillage, who remixed “Send Me An Angel” but “Openhearted” was the work of producer Ross Cockle. “Catch Me I’m Falling” was the US followup single and it failed to crack the top 20, but not for not trying. The tone on this single is lighter and poppier than the preceding single. It instead offers a sweet ebullience that recalls A Flock Of Seagulls at their poppy best [think “Space Age Love Song”]. In fact the great guitar playing here by vocalist David Sperry, sounds very similar in style and tone to that of AFOS’ underrated Paul Reynolds. I usually correlate Real Life with Icehouse in my mind. Both were Oz bands making au-courant synth-rock but Icehouse predate this lot by several years. Both had something to offer these ears, though. And each band had a great song about Australia itself. Icehouse had an anthemic, widescreen ballad on their second album; “Great Southern Land.” Their paean to their island nation. 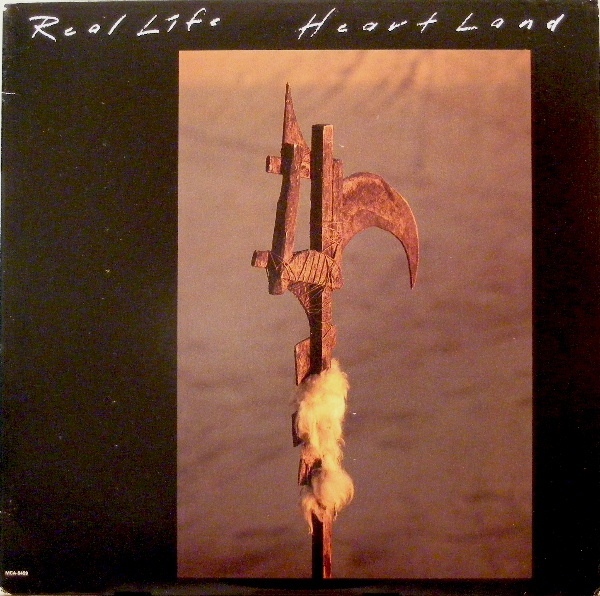 Here, Real Life proffered the somewhat more tender sentiments of “Heartland,” the atmospheric title track. While Real Life must have had some strong Ultravox [Mark I + II] influence in their development, for “Breaking Point” they managed to craft a song that managed the feat of pointing towards an Ultravox song that would not exist for another year. The vibe, arrangement, production, and sound design here [by the group’s secret weapon, Richard Zatorski – keys/violin] come very close to where Ultravox later went on the title track to their “Lament” album of 1984. It sounded to me like the influence was a two way street between the two bands. Side “two” started out with a bang with the dynamic and urgent “Broken Again.” Richard Zatorski got to really put his violin to work here and the sequencers [or are they arpeggiators?] keep the energy humming at breakneck speed on this should-have-been-more-than-a-deep-cut. How this was not a single in some better world stymies me to this day. I’m not exactly certain, but this song may have also been the first time I ever heard the legendary 8-Bit Orchestra Hit® from the Fairlight sample library. It was crucially used, and not abused here with a fairly light hand, and even today I can hear it with innocent ears. While there are instances of sampling used on the album, the band had a light touch that helps keep the album from sounding terribly dated. Primarily, this was a band about performance. The album closed with “Burning Blue,” the only song that I’ve ever heard that picked up the sound of the title track to Ultravox’s “Rage In Eden” and run with it. The staccato rhythm programming here was very close to what Ultravox had created on the song “Rage In Eden.” It’s possible to begin reciting the lyrics to that one over the intro here. Of course, once Sperry begins singing, the song creates its own niche, but the detuned piano also manifests here, marking the band as big Ultravox geeks. It’s impossible to listen to this album without catching scent of that band’s spoor on the ground here. The bonus tracks are a mixture of 12″ mixes and B-sides. “Send Me An Angel” received a nice buildup, but the real treat was the song’s middle eight, unique to the 12″ version where Zatorski got to take flight for a few bars in the best way possible before Sperry’s guitar brought it back home. The B-side was “Like A Gun,” another fine track as produced by Ross Cockle and Glen Wheatley that probably lost out to the inclusion of “Exploding Bullets” on the LP. “Catch Me I’m Falling” appeared here in a 7″ remix that was longer than the LP version [!] and an even more expansive 12″ mix. The biggest difference to the mixes was the inclusion of a vocoded call-and-response section in the extended intro that both mixes featured. It was the era when 7″ mixes edited from a 12″ mix was just starting to become a common production gambit. The mixes in this case were by Steve Hillage, the original song’s producer. The poppy “Always” got shaken up [and not stirred] in a Germany-only remix that was called “special dance mix – raunchy version!” The word “raunchy” might have a different meaning in Germany then, as the mix here was thick with abrupt edits of the kind common to the era, but the underlying song was so light and airy that I don’t think it could attain “raunchiness” if its life depended on it. 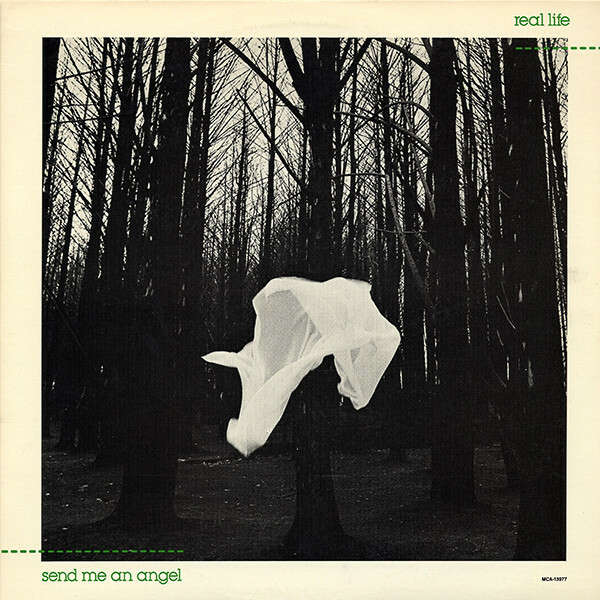 “Send Me An Angel” got a post modern remix in 1988 and that remix was released in The States in 1981, leading to it being called “Send Me An Angel ’89” by the time it reached the bins here. Considering how badly this could have turned out, the song was just reconstructed with new rhythms, that were slightly more intense than on the ’83 original. I prefer the original sound design, given the choice, but if this were the only version out there, it would have still passed muster. Finally, there was also another non-LP B-side, and it’s the jewel in the crown of this DLX RM. If you’ve never heard the B-side to the Oz “Openhearted” 7″ and you are a fan of INXS then you would drop your chins upon hearing “Pick Me Up.” The 1983 track is nothing if not the absolute blueprint for my favorite INXS A-side, “I Send A Message” from, uh, 1984! Gawp in wonder as you hear how every element of this remarkable song was plundered outright by INXS, who at the very least, had the vision to comprehend that such a song deserved far more than being relegated to a Southern Hemisphere only B-side! This entry was posted in Remastering and tagged 1983, DLX RM, Heartland, Oz, Real Life. Bookmark the permalink. Yeah, as much as I love their first album, and quite like many moments on their second, listening objectively and critically, AFOS are a miserable excuse for a band. 100% of the magic in this band was coming from Reynolds, and that’s why 30+ years later people still only discuss AFOS because of Mike Score’s hairdo, never because of their music. If you strip away Reynolds, all that is left are generic rhythms no more interesting than what came out of a pre-programmed Casio home keyboard of the era. Listen to Space Age Love Song, and ignore the guitar. I can’t imagine a way to make that track less interesting. Remedial, at best. But add Reynolds, and …boom! I’m still listening, after all these decades. The second AFOS record, since you haven’t heard it, is uneven, but has some gems. The cloying first single “Wishing” is dominated by a three-note sing-song synth line that gets tedious before the intro ends. But the follow-up single “Nightmares” contains more nice guitars by Reynolds and a suitably dark feel to it. Some of the deeper cuts are good too. Even Reynold’s magic couldn’t save their third album though, which is miserable by all objective metrics. He bailed soon after, and has balked at all reunion offers, except a one-night VH1 thing. JT – If Paul Reynolds is playing jazz now it must have been a real straitjacket for him to be saddled with those guys for as long as he did. If I recycled the first album, maybe the second is a no-go zone for me. At the end of the day, I’d settle for that first US EP as the goods I’d care to have with the “Modern Love Us Automatic” and “Telecommunication” singles. I really liked them in the 80’s and keep their music in my collection but almost never listen to it anymore They fit for me on a plane that was The Fixx, Ultravox and them They got all super-earnest with a single called “God Tonight” around 1991 and that one is a guilty pleasure of mine. I always thought that they deserved more attention at the time than they received & if anyone was eating their cake commercially in the US it was probably the FIxx more than anyone else. Tim – You may be right about The Fixx soaking up all the synth-rock oxygen in conservative America back in the day. There was probably only room for one such band and they grabbed that brass ring. Sorry Ultravox! 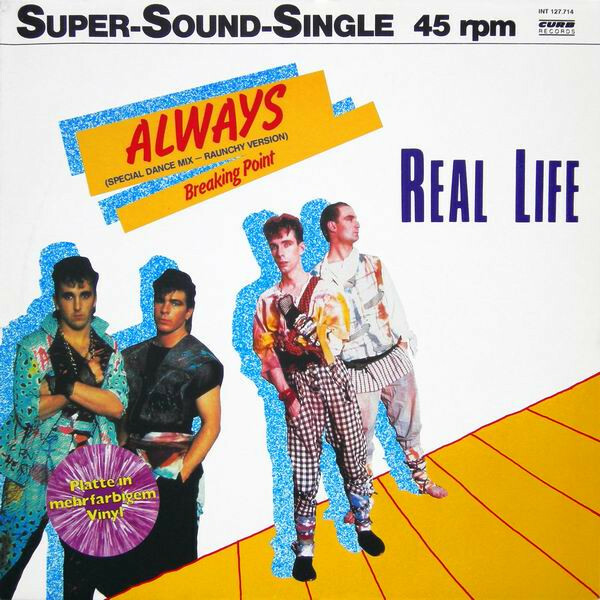 At least Real Life had a Top 20 hit over here and had a U.S. tour that even hit the backwaters where I lived at the time. In contrast, they were number one on the West German charts for a full month! I’ve enjoyed having this album back in rotation for the first time in 30 years. Unlike AFOS, it holds up for me. I recently got the album with “God Tonight” on it and though the band lost a lot of their secret sauce when keyboardist Richard Zatorski left after the second album, “Flame,” they still were just on this side of the “still good” line. I’ll probably stop my Real Life collection with the “Lifetime” album of 1990. The level of playing and writing without Zatorski was just not as accomplished as the band once was. I will say that “God Tonight” is probably my favorite song by the band, in spite of the somewhat more banal arrangements and playing. Just for its theme and sentiments.